Buying the best paint sprayer for the money is not easy! It means that you want to get a paint sprayer that offers a good value for your investment. While you will easily come across many sprayers on the market, it can be difficult to actually come down to one that delivers excellently. With a dig around, we were able to come up with some of the best value paint sprayers with different price points and features. Because no one sprayer is the best, we have chosen five models that fit this criterion. If you are willing to save some extra money on the next painting project, paint sprayers are going to make your job much easy. Finding the right paint sprayer can be a tricky process. You want a tool which is versatile, reliable and yet affordable as you need to get the best out of your investment. A wide number of paint sprayers are available in the market. 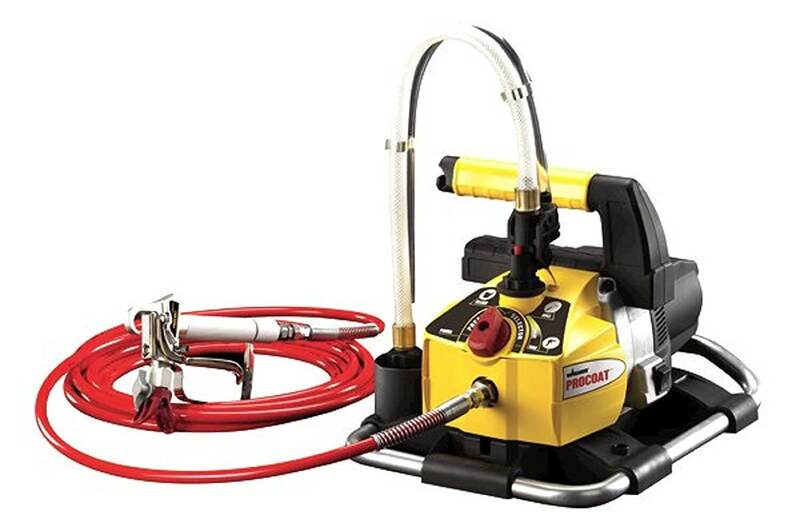 In this article, we have reviewed the top models of paint sprayer. The Wagner 518080 Control Spray Max HVLP Sprayer comes equipped with a 20-foot flexible air hose. This is typically more than enough length to handle most painting jobs with ease. Whether you are painting a tall fence or cathedral ceiling, the 20’ air hose will let you reach even the highest peaks. The Wagner 518080 Control Spray Max HVLP sprayer comes equipped with two air filters, preventing dust from marring the finish. The result is even and smooth. The unit is contractor grade for the woodworker who takes pride in their finished products. It also comes with a 1½ quart plastic cup for larger jobs such as staining or painting fences and decks. There is a 1-quart metal cup in the package for smaller jobs that require more detail, like trim and window panes. The unit weighs a total of 9.8 pounds, with dimensions of 18.5” x 11.5” x 11.8” (length, width, height.) The shipping weight is 10 pounds. It is lightweight, yet powerful. When you purchase the Wagner 518080 Control Spray Max HVLP Sprayer you will receive the sprayer, plastic cup, metal cup, flexible 20’ hose and the user’s manual. You’ll have everything you need to start working on your project right away – you just supply the paint. In addition, there are several accessories available for the Wagner 518080 Control Spray Max HVLP Sprayer. Consumers who purchased this on Amazon also purchased safety goggles, masks, painter’s tape, and drop cloths. Paint strainers and sanders are also a popular item to accompany this unit. The paint sprayer is lightweight, yet powerful enough to do large jobs like fences, decks and walls. The two-stage turbine allows for thick liquids like latex, and thin ones like stains and lacquers. Because you can adjust the air pressure control, you’ll have less overspray deal with. And you’ll be able to spray a whole lot of materials as the sprayer comes with a range of 1.50 to 2.63 psi. The 20’ flexible hose lets you extend your reach. The sprayer is equipped with 510 watts of power, allowing for a professional finish to any painting project. It can only be shipped within the U.S., as well as some APO/FPO addresses. For thick latex paints, it does seem to require some thinning; this is normal for most painting jobs, however. It’s best to consult with the paint manufacturer or paint store that you buy your latex paint from, to get the best results. It may take some time and ‘fidgeting’ before you find the best setting for the particular job you are doing. Overall, the Wagner 518080 Control Spray Max HVLP Sprayer seems to provide good value for the money. It can do both large and small jobs with ease, and work well with thick and thinner materials, such as latex and stains. The hose allows for easy reach, and it is lightweight enough to carry for long periods of time. The air pressure control will lessen overspray of thinner materials, and the three spray patterns allow you to select the best pattern for your particular project. 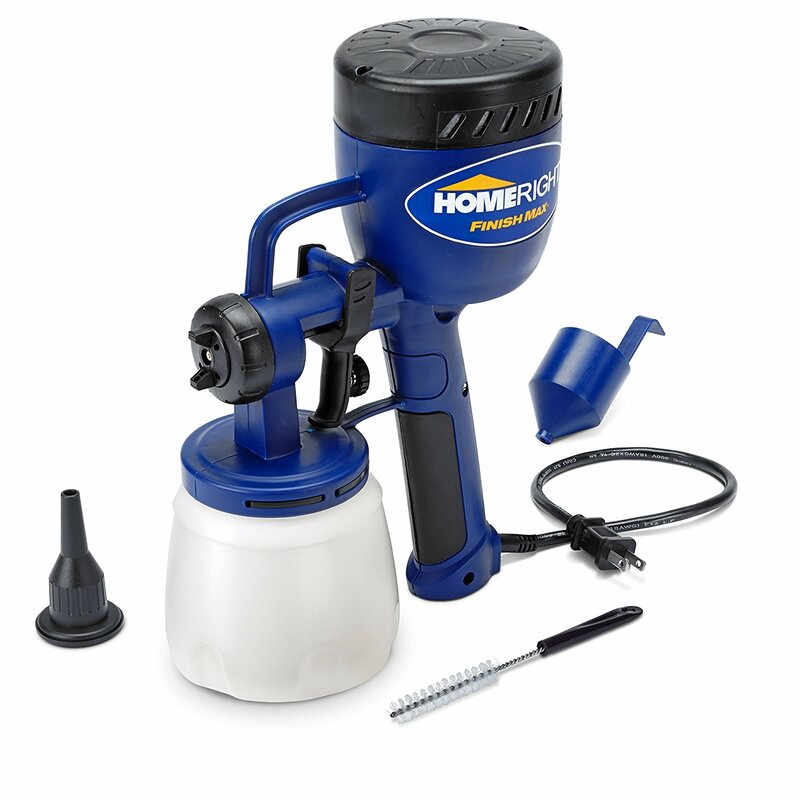 HomeRight Finish Max Fine Finish HVLP Sprayer happens to be one of the premier paint sprayers. It comes with the three-way spray setting that offers detailed and precise control over the job. Adjustable spray patterns along with low price, precision volume control contribute to making this product predominant for woodcrafts, cabinets, fixtures, furniture and fitting over different similar options. It is possible to utilize viscosity cups prior to maintaining the determination of thinning needs. You can pour the liquid into viscosity cup for finding out the time which is required for draining the liquid from the cup. Also, you can do it easily and at the same time, it is quite effective too. You can clean the cups with the aid of warm and soapy water in case you are utilizing water-based projects. It is considered to be an ideal option for small and medium projects, though it can be used for the large projects as well. Moreover, the sprayer’s 2.0 mm brass spray tip and housing are beneficial for improved performance and longevity. Graco Magnum 257025 Project Painter Plus Paint Sprayer is one of the well-renowned sprayers that are capable of handling some of the most prominent home improvements projects like interior projects, fences, and decks. The Graco X5 enables spraying directly from 5 or 1-gallon container letting the completion of larger projects in no time. It has Reverse-A-Clean Spray Tip which happens to be one of the best features of this painter that clears the tip plugs along with a twist. This sprayer is recognized to be one of the most common features of this sprayer that connects to the garden hose with an eye to cleaning up at a faster rate. 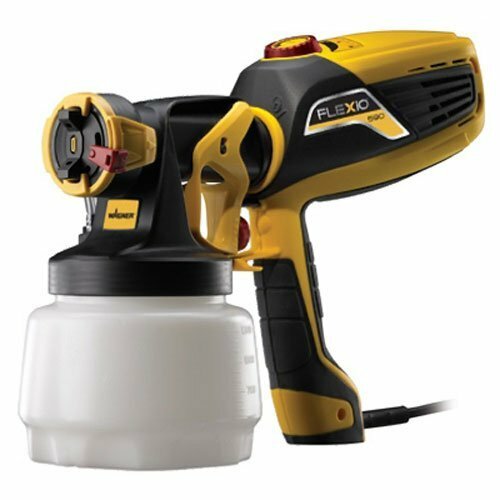 Easy Adjustable Pressure happens to be one of the features of this paint sprayer that provides the ultimate control for paint flow. Low and stable profile along with integrated pail hook and thus it is possible to carry everything with ease. 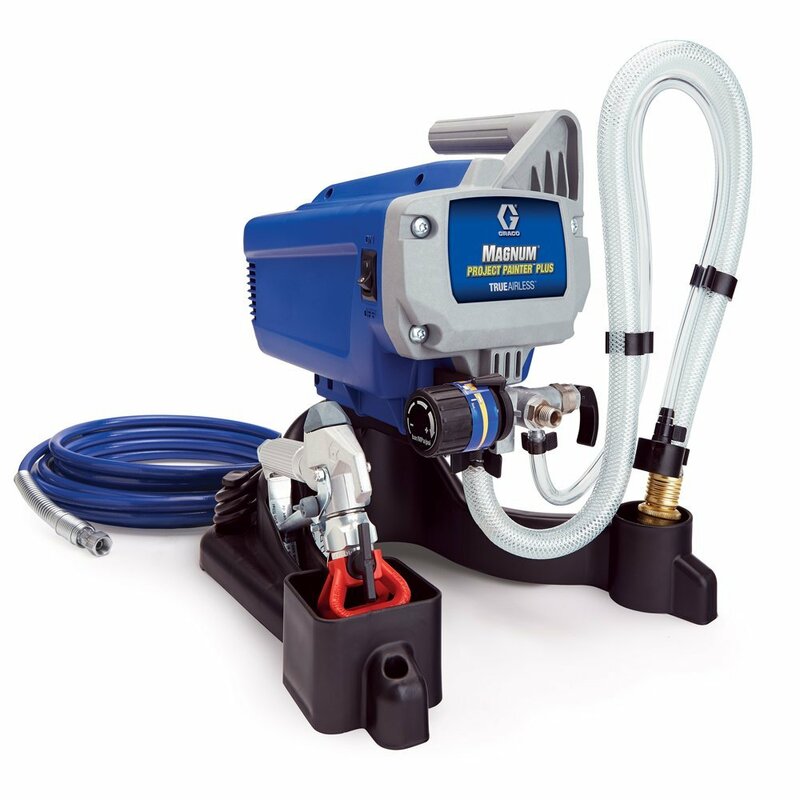 Plus the stainless steel piston pump enables spraying paint unthinned at very high pressure. If you are looking for the best airless paint sprayer for the money, this is a good option. There is a learning curve involve especially for first-time users. The Wagner Flexio 590 Sprayer is considered to be an indoor and outdoor hand-held sprayer kit which is ideal for different projects. It offers low overspray, full coverage, and adjustable control. And it’s recognized to be a sophisticated tool and people love having it in their homes. It is small and lighter in weight. It offers more than 60% of the airflow for offering smooth and professional coverage without the coating. Also, the X-Boost Turbine happens to be three times more powerful as compared to the traditional high volume that allows spraying coating. 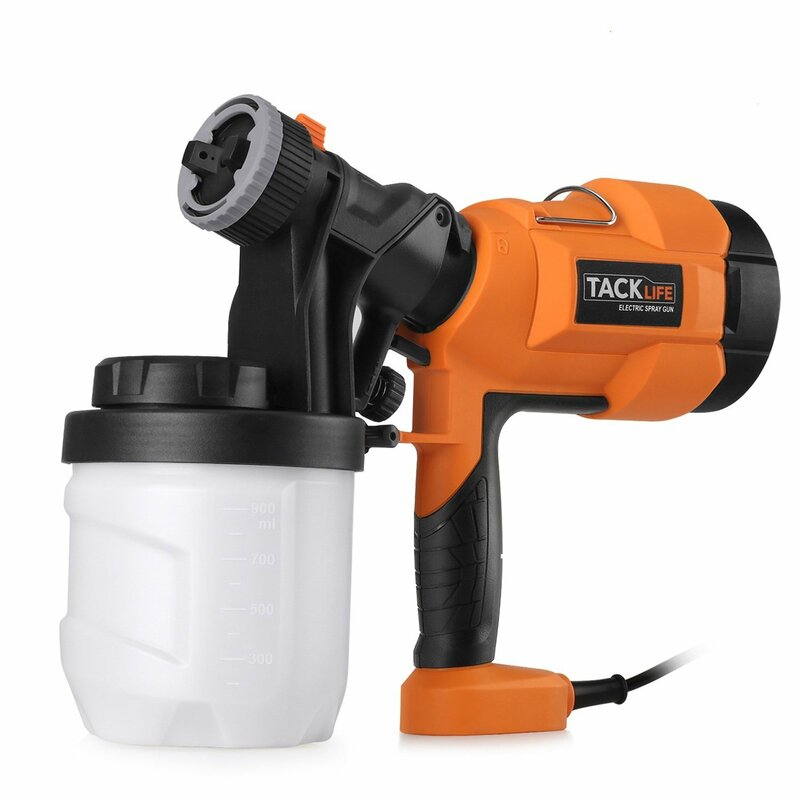 Tacklife SGP15AC Paint Sprayer happens to be one of the well-renowned paint sprayers which have gained high prominence in these days. Three nozzle sizes and three spray patterns are essential for using at work or home with ease. It comprises exclusive Easy Fill Canister that permits clean and fast refills. The integrated Smart Select spray tip is useful for making a user-friendly adjustment which can be understood with ease. It is possible to remove each and every part of the machine at ease. Thus, you can clean the same in a convenient manner. And its adjustable valve knobs are beneficial for the adjustment of flow rate for the coating speed. This product is designed for faster application of heavy coatings, primers, glues. The tool enhances productivity and saves money with the reduction of waste. Holding the gun can be done from any angle along with different fill levels at the time of maintaining proper suction and without the spillage of paint from the canister. It features a large Adjustable Fan Along With Superior Atomization. It is possible to adjust the fan up to a size of 11 inches and offering clean and even coverage which cannot be matched by the brush. Two-piece construction with the gun features an exclusive design of air valves. The Graco Magnum X5 Airless Paint Sprayer is one of the top paint sprayers on the market these days. The Graco Magnum X5 is a big hit among a growing number of homeowners because you can use it to do retouches on old paint jobs periodically or about 4 to 6 times a year. This paint sprayer has a light, compact, portable design which makes it very suitable for both interior & exterior painting. It can work on houses, decks, fences and other light duty projects. Weighing less than 19.2 lbs., it is also very easy to store. The Graco Magnum X5 also features a powerful ½ HP motor which can deliver 2800 PSI of pressure. It can spray light to medium coatings and it can work on stains to latex. 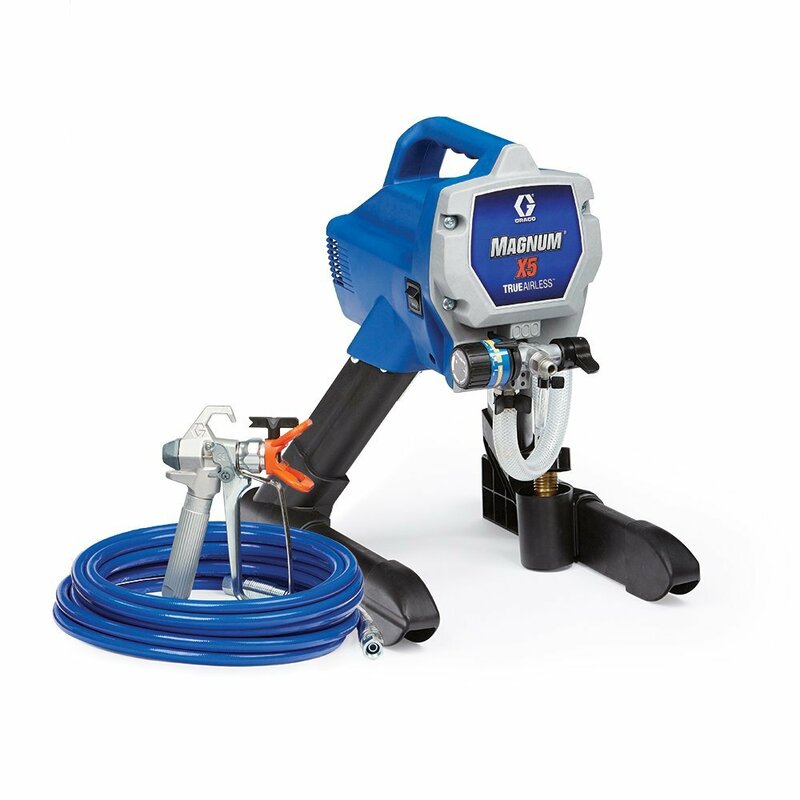 Since the Graco Magnum X5 Airless Paint Sprayer supports longer hose lengths, users can easily extend its reach. With its hardened stainless steel Piston Pump, you can ensure that this paint sprayer does a good job and will last for a very long time. The Graco X5 is also very easy to use as you can easily set the correct pressure for rolling or spraying. Cleaning is also not a problem with Graco X5. It has a power flush cleaning adapter that can fit into any standard garden hose. To clean this paint sprayer, all you need to do is to connect it to your garden hose and in a matter of minutes, you can clean its hose, pump, and gun. Maintenance is also out of the question since this paint sprayer comes with a lifetime lubricated pad. The Wagner 0515077 ProCoat V2 Paint Sprayer continues to receive praises and high star ratings from users because of its amazing features. Aside from doing an excellent painting job, the Wagner ProCoat can speed up the task and cut your work hours in half. The Wagner ProCoat airless paint sprayer is so easy to use, users can draw paint or stain directly from a 1 gallon or 5 gallon can. It can spray thick latex paints w/o thinning. Aside from being lightweight, it also has a convenient carrying handle so users can easily carry it around the job site. The Wagner 0515077 ProCoat V2 Paint Sprayer features a contractor-grade siphon tube and a very reliable piston pump which ensures a reliable spray of thick latex paints, thin stains and sealers in one go. 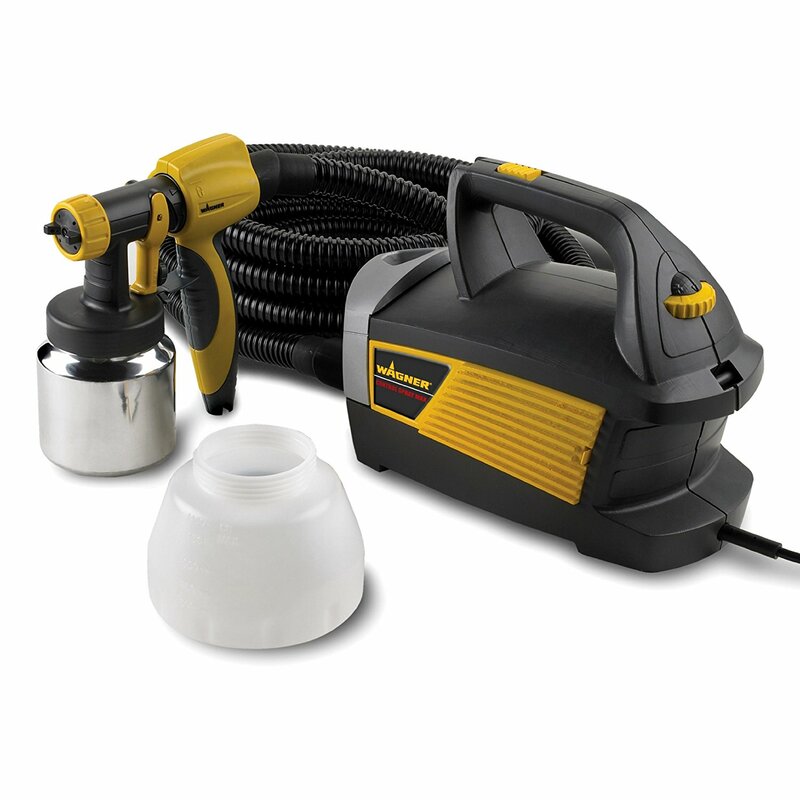 This paint sprayer from Wagner features a ½ HP motor that runs on 120 volts of electricity. It can deliver up to 2800 PSI and about .24 GPM. At this rate, users can guarantee that the paint job results will be similar to that of a professional sprayer’s. 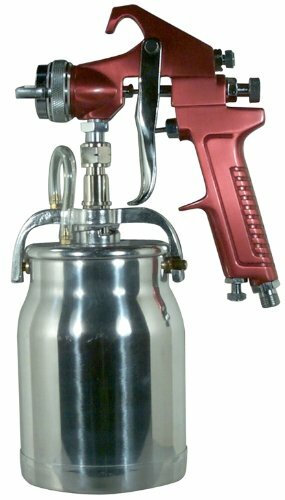 The Wagner 0515077 ProCoat V2 Paint Sprayer also has an adjustable pressure that controls overspray and a spray gun swivel for increased comfort. With these features, you can use this paint sprayer on fences, sheds, decks and even, barns, sheds, lawn furniture and children’s playground equipment. Cleaning up after using this paint sprayer is also very easy as all you need to do is to snap the inlet hose in place then attach the pressure hose as well as a gun to the outlet. And there you have it, quick flush cleaning of the entire system in a matter of minutes. If you are willing to invest in a paint sprayer, you can give a consideration to choose from the above-mentioned ones. Of course, they have some drawbacks but considering the features they offer, they are worth the investment. With a few more findings such as reading more reviews on the actual product page before buying, you can make an informed decision. This is because you will be knowledgeable than the average search on how to select the best paint sprayer for the money.